ASID & REMO: Kindle Countdown Deal, 8-13 September! You want some AMAYSING AMAZING science fiction for cheap? You like operating under pressure of a deadline, right up against the wire? How about both? 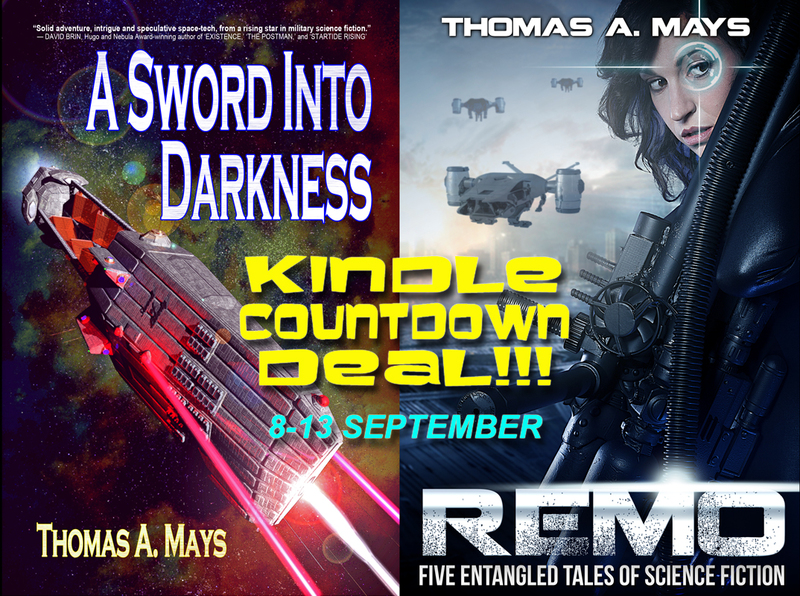 Monday morning, both A Sword Into Darkness (316 reviews and 4.4 stars) and REMO (33 reviews and 4.3 stars) go on sale for the low, low price of 99 cents at Amazon.com. That’s both e-books for your Kindle device or app for less than two bucks! But maybe you’re not sure, so you decide to think it over for a day or two. TOO LATE, SHIPMATE!! On Wednesday, the price jumps to a still low, but not as insanely low $1.99. That’s okay, you think. It’s still in cheeseburger territory. I can wait. WRONG MOVE, MISSY!! It’s a countdown deal! The time is counting down and the price is counting up! Now, Friday, REMO’s back to $2.99 and ASID joined it, still a dollar off the usual price but the sale is almost through. Will you allow yourself to miss it? Will you allow your fun and sci-fi loving friends and family to miss it?! And if that wasn’t enough, I’m offering a discount code for trade paperback version of A Sword Into Darkness during that same period. Use Discount Code 5TF4MWZN at Createspace this week, and you’ll get $4.00 off the regular list price of $15.99. That’s just $11.99 for physical ASID you can hold in your hot little hands, this week ONLY. Plus (I CANNOT BELIEVE THERE IS A PLUS) you can still get the ASID audiobook for FREE at Audible.com with your free 30-day trial membership. Honestly, it’s like Chistmas in September. I am far too good to you people, but that’s me. Selfless. In love with the world and always trying to give back. If I wasn’t just the humblest person on the planet, I might put myself in for saint-hood. This entry was tagged A Sword Into Darkness, Amazon Kindle, Audible, audiobook, Createspace, E-book, Military science fiction, on sale, REMO, sale, science fiction, trade paperback. Bookmark the permalink. So cool, but I already have both books. Enjoyed them immensely. Got them both already but I desperately need number three !!!!!! Working on book 3 now, though it’s totally unrelated to the previous two. I have notes and outlines for the sequel to ASID, but I gotta finish this project first. Thank you!